Stuttgart - FC Bayern München maintained their eight-point advantage at the top of the Bundesliga and sent VfB Stuttgart to the foot of the table with a 2-0 win at the Mercedes-Benz Arena. Arjen Robben's sweet volley gave Pep Guardiola's men the lead just before half-time and an unstoppable free-kick from David Alaba just after the break secured the Rekordmeister their first league win of the calendar year. Stuttgart built the proverbial wall around their penalty area, refusing to let Bayern penetrate it while waiting for the chance to storm out from behind it. Their approach appeared to be working too, with Bayern dominating the possession stakes as they have become accustomed to doing, but Stuttgart carving out the better chances with Timo Baumgartl unable to get direction on a header from a dangerous position. Baumgartl then got in the way of his own goalkeeper Sven Ulreich, whose punch clear of the Stuttgart barricades was nonetheless successful. With the capacity crowd roaring them forward at every opportunity, the Swabians grew in confidence and on their next attack, Christian Gentner laid the ball back for Gotoku Sakai, whose curling effort grazed the outside of the far post. Bayern only needed a sniff, though, to grab the lead before the break. Robben saw his route to goal blocked initially, but a pass from Mitchell Weiser saw the ball sit up nicely for him to strike with the sweetest of volleys beyond the reach of Ulreich and into the far corner. It was the Dutchman's 12th goal of the season - more than in the whole of the last campaign - and came at just the right time to give Bayern a confidence boost going into the second half. Indeed, Guardiola's men showed far more composure after the break, doubling their lead with a stunning Alaba free-kick from fully 25 metres. It was the Austrian's first Bundesliga goal in almost a year, and one which was certainly well worth the wait. 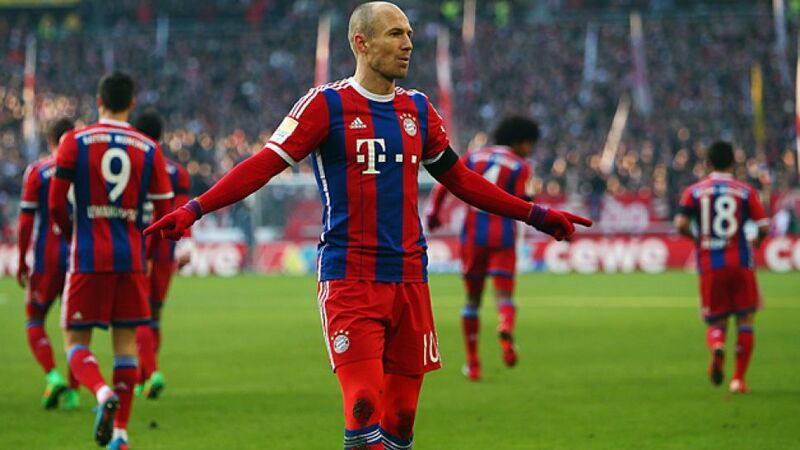 It was also Bayern's tenth goal from distance this season, twice as many as in 2013/14. It suddenly started to look easy again for Bayern, who had raced into an eleven-point lead at the top of the standings during the first half of the campaign. There was purpose to their possession as they ran Stuttgart ragged, never looking like they would concede a goal, let alone relinquish their lead. Robert Lewandowski volleyed high and wide from close to the penalty spot, but the Bavarians did not seem desperate to add a third. Keeping the ball and celebrating their first win of 2015 was all that mattered, although they could and probably should have boosted their goal difference when Lewandowski was denied by Ulreich late on, not that it made any difference to the outcome.